It’s no secret that I place a lot of value in practicing creativity. Living a creative life holds so many benefits, from increasing productivity, to improving your health, to reducing stress. Unfortunately, many of us struggle with the creative process, whether that’s finding time to create, facing the dreaded creativity block, or simply not knowing where to start. And with that in mind, I’d like to tackle the latter obstacle today. If this sounds like you, then you’re in luck. 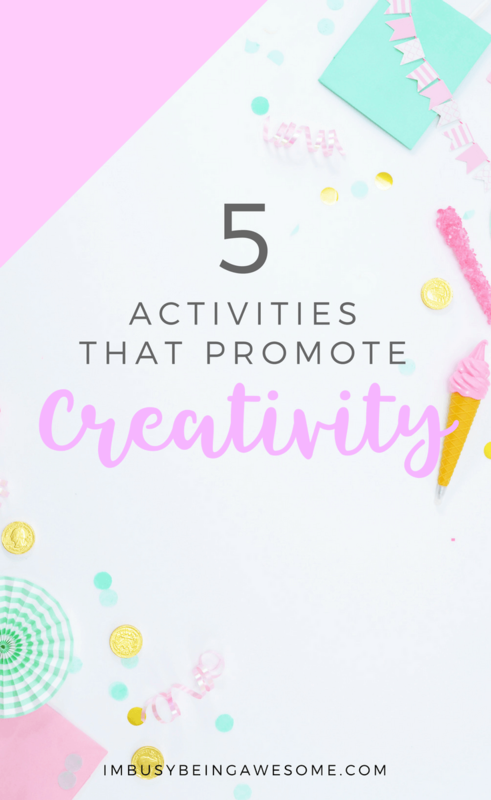 Because this post explores 5 activities that promote creativity, and how you can get started today. We will explore the world of gardening, painting, DIY, blogging, and writing. We’ll consider where to begin, what materials you need, and helpful tips to keep in mind. By the time you’re done reading, you’ll be ready to head to the store, pick up your supplies, and get creating. I’ve been wanting to grow a garden for years, but I’ve never taken the time to actually start. As I mentioned above, I felt intimidated by all the steps involved; I didn’t know what supplies I needed, what kind of plants to buy, when to start planting etc. So if you’re like me, and you would love to express your creativity through gardening this year, give these steps a try. Think about what kind of garden you want to grow, as this will impact your later decisions. Do you want a vegetable garden? Are you yearning for a beautiful, colorful array of wildflowers? Do you want a little bit of everything? The choice is yours! According to Better Homes and Gardens, “[a]lmost all vegetable and most flowers need about six hours of full sun each day.” So take some time to survey your yard or deck. Is there anywhere that gets this ideal kind of sunlight? If not, don’t worry. There are plants that also grow well in shade or complete sunlight. It’s just important to know what type of location you’re working with. It’s easy to get over ambitious when planning a garden. If you’re just starting out, begin with a small plot, maybe 3 feet x 3 feet. This allows enough space for growing, but it won’t get too overwhelming. Save yourself unnecessary stress, and simply ask your local garden center what types of plants work best with your soil and sun exposure. They’re the experts after all, so let them help! You’ll save time, and you’ll also feel confident in your choices. Follow the instructions on the back of the seed packets, and start planting! Keep your seeds moist by watering daily. As the plants grow, you can water less frequently. You’ll know when your grown plants need a drink by paying attention to any wilting. As Jackson Pollock once said, “painting is self-discovery.” So if you’re looking for a way to dig deep and start expressing your creativity, why not give painting a try? If you’ve never painted before, try not to get overwhelmed by all of the different options out there. I’d recommend starting with either acrylics or watercolors. Acrylics are quite versatile. You can paint them in very thin layers or thick like oils. They dry quite quickly, and they’re water-soluble, which means you only need soap and water to clean the brushes. Watercolors are often lighter than acrylics, and you don’t get that thick, layered look. They are easily accessible, however, and great for beginners. Once you decide on your paint, it’s time get materials. Luckily, you don’t need much. Brushes, a few colors of paint, and a surface for painting are all you really need. If you’re using acrylics, you can try painting on canvas, thick paper, wood, cardboard etc. Watercolors are a bit less versatile, and do best on watercolor paper. She also reminds us that you should start painting with bigger brushes, and save the smaller ones for detail work. Watercolor bushes are softer, which allows for more fluidity in your strokes. Marder recommends beginning with a starter set so you can experiment with the different sizes and see what you like best. Now it’s time to dive in. And remember, this doesn’t have to be perfect; our goal is simply to explore activities that promote creativity. Don’t let the fear or perfectionism hold you back. Grab your brush, squeeze out some paint, and get started. If you’re facing a bit of creativity block, consider going for a walk and looking for inspiration. You could also simply paint what’s in front of you. Alternatively, check out my post, How to Break Through a Creativity Block and get started now! For all my aspiring DIYers out there, this one is for you. Similarly, if room redecoration is in your near future, don’t brush off the fun and creativity of DIY! Just a basic staple gun is all you really need to secure your new fabric to the furniture. This is used to nail in final touches and decor. Verdi recommends wrapping “your hammer with batting and secure that with a rubber band,” which helps protect any grommets or flourishes from scratching. Look for heavy-weight upholstery fabric, which will hold up with wear and tear. This is especially true for things like seating. This is what you stuff into the furniture to create comfortable padding between the fabric and the hard surface of the furniture. It also helps give the piece shape. Of course, your specific approach will vary depending on what piece of furniture you’re remaking. Check out YouTube for thousands of great step-by step-tutorials on how to approach your specific project. After working so hard on your newly upholstered furniture, you might consider investing in some good window tinting to prevent your hard work from fading in the sun. 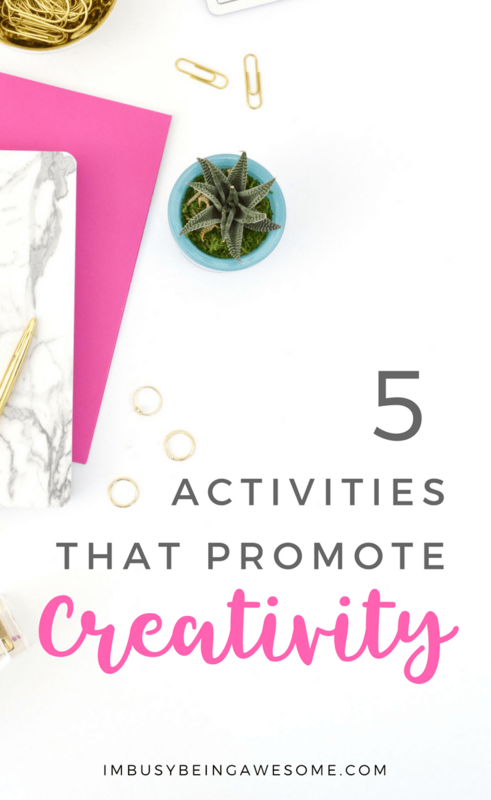 Of course, blogging is one of my favorite means of expressing creativity, so I can’t recommend this activity enough. And whether you’re interested in starting a blog to explore a new passion or to start making an income, the beginning steps are very similar. The first step is to understand why you’re embarking on the blogging journey. Are you looking to make some extra income? Do you want to share your passion with a wider group of people? 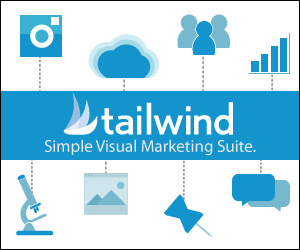 Are you looking for ways to give your business exposure? All of these are great reasons. The important thing is knowing yours. This may sound obvious, but it’s nevertheless worth stating: blog about something you enjoy. You will be spending a lot of time with this subject, so make sure it’s something that excites you! Also, choose a niche that helps you focus your blog topics. This is key as you build a regular readership. 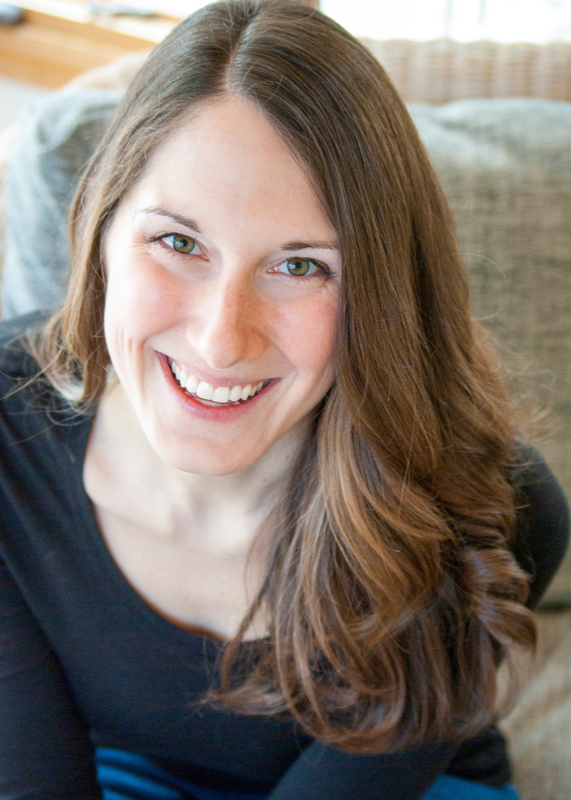 Let me explain… If you blog about gluten free cupcakes one day, the best brand of lipstick the next, and then how to create a podcast after that, your readers won’t know what to expect. By focusing on one general topic, however, you create consistency. And in turn, you bring back readers interested in that subject. There are many options out there, though I highly recommend starting with WordPress. And within wordpress, you have two different platforms. The first platform is hosted by WordPress, and it is free. If you’re simply looking for a place to share your passion or explore new ideas, wordpress.com could be an option for you. If you hope to grow your blog into a means of making money, however, I highly recommend the second option. The second platform is self-hosted. And while this option does cost money, you have much more freedom and control over your content. You can find this as WordPress.org. If you opt for a self-hosted website, you also need to choose a host. I currently use Bluehost, and I have had great success with them. This is your website’s address. A domain name will cost somewhere around $10-15 per year. Choose your WordPress theme. Create your about page. And then start sharing your great content! Writing is one of those creative outlets that is so simple, yet can feel so challenging at the same time. In fact, I know many people who dream of writing a book, publishing their poetry, or submitting an op-ed to the paper, but they’re simply too afraid to start. Here’s some tough love. If you don’t start writing, you won’t have anything to publish. It’s as simple as that. So here are four easy steps to dig deep, embrace your creativity, and finally start writing. Choose a specific place, and designate it as your writing spot. This might be in the creativity nook of your office, at the kitchen table, in the reading room of a library, or at a bustling coffee shop. Select a time that you will return to your writing spot each day. 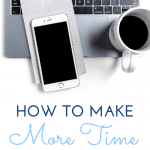 The length of time you spend writing might vary depending on your schedule for the day, and that’s okay. The important thing is establishing a time that is dedicated strictly to writing. Do you prefer writing on a computer? Are you a pen and paper person? 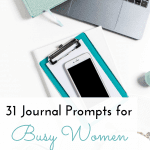 Do you like spiral-bound college-ruled notebooks or are you a fan of your bullet journal? Over the first few weeks of writing, try out a few different mediums to see what you like best. Once you know, stick with it. Consistency is key when it comes to writing. Choosing a goal is a great way to motivate yourself each day. Many people choose a word count as their goal. Perhaps you strive to write at least 500 words a day, for example. You could also set a goal to write for at least 15 minutes a day. Either approach is great. The important thing is to keep writing consistently each day. There you have it, friends! 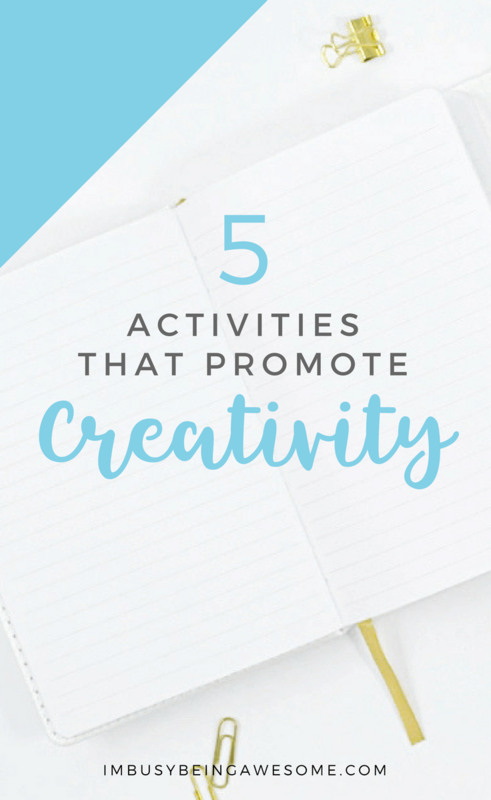 5 fun activities that promote creativity. 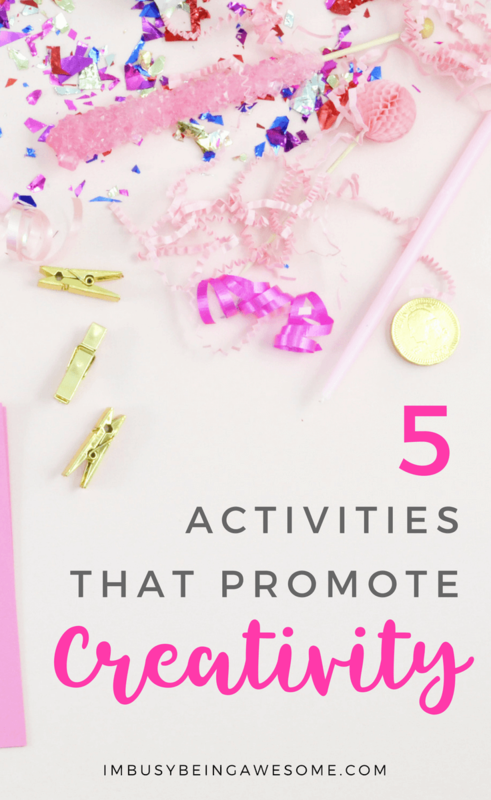 If you’re looking for more tips on creativity, be sure to check out my post, how to live a creative life, and download my free workbook, which helps you explore the creative process even further. These are great ideas! I have a job that is more analytic than creative so I am always looking for creative outlets. I need to do more of all of these things. Maybe work on getting rid of my “black thumb” lol! Love this! 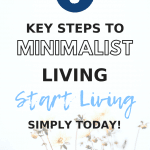 I started blogging, because I so needed some creativity in my life. 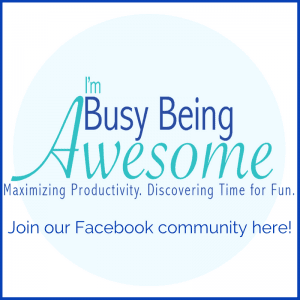 I am blogging too, and it’s a great outlet for a mom! All the stories we can tell! You almost have me convinced to start gardening. My mom always gardened and I hated it, but now I think “How nice to just work on something like that quietly out in the sun?” And I’m sure no one would want to help me so you get alone time, too. Lol! Love the intro to upholstery… I have always wanted to try redoing some old chairs…but didn’t know where to start!